Episode #374 Part I: Superman Comic Book Cover Dated October 1964: Superman #172! Download Episode 374 Part I! SUPERMAN 172, October 1964, was published around August 6, 1964. It contained 32 pages for the cover price of 12¢. Mort Weisinger was the editor, and the cover was pencilled by Curt Swan, inked by George Klein and lettered by Ira Schnapp. - (15:50) THE NEW SUPERMAN (24 pgs. ), written by Edmond Hamilton, pencilled by Curt Swan and inked by George Klein. The story was divided into three 8-page parts. Also highlighted in this episode are the issue's ads and other features, including the short article, HOW PERRY WHITE HAS HELPED SUPERMAN and the METROPOLIS MAILBAG letter column (53:25). The episode begins with the MY PULL LIST segment, where I review the comic books I ordered from Discount Comic Book Service which carried the December 2017 cover date. and were released during the month of October 2017. Next episodes: SUPERMAN FAMILY COMIC BOOKS COVER DATED OCTOBER 1964: PART II: SUPERMAN'S GIRL FRIEND LOIS LANE 52, PART III: ACTION COMICS 317 & PART IV: SUPERMAN'S PAL JIMMY OLSEN 80! Episode #373 Part V: Superman Comic Book Cover Dated September 1964: Action Comics #316! Action Comics #373, September 1964! Download Episode 373 Part V! ACTION COMICS 316, September 1964, was published around July 30, 1964. It contained 32 pages for the cover price of 12¢. 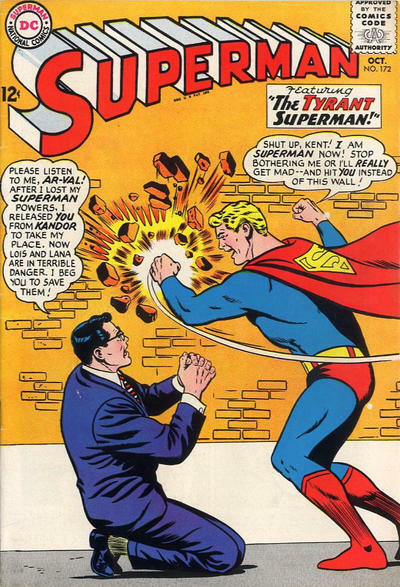 Mort Weisinger was the editor, and the cover was pencilled by Curt Swan, inked by George Klein and lettered by Ira Schnapp. 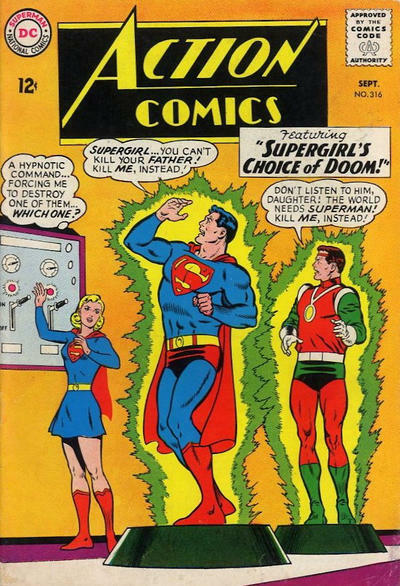 It featured the Supergirl story in this issue, and was her 17th appearance on the cover of ACTION COMICS. - (7:24) Superman starred in the fourteen page story, ZIGI AND ZAGI'S TRAP FOR SUPERMAN, written by Leo Dorfman and drawn by Jim Mooney. This story was reprinted in LIMITED COLLECTOR'S EDITION C-38, October/November 1975, published on July 3, 1975. It contained 64 pages for the cover price of $1.00. - (28:25) Also during this episode, we highlight the ads and other features in this issue, including the short article, SUPERGIRL'S BOY FRIENDS, and the METROPOLIS MAILBAG letter column. - (37:18) Supergirl was featured in the ten page story, SUPERGIRL'S CHOICE OF DOOM, written by Leo Dorfman, drawn by Jim Mooney and lettered by Milt Snappin. This story was reprinted in SHOWCASE PRESENTS: SUPERGIRL vol. II. - (52:10) Since this is the final Superman issue to carry the September 1964 cover date, that means it's time for the monthly ELSEWHERE IN DC COMICS segment. There were 31 titles which carried the September or September/October 1964 cover date, according to Mike's Amazing World Of DC Comics. Beginning next episode we will feature the SUPERMAN COMIC BOOKS COVER DATED OCTOBER 1964: PART I: SUPERMAN 172, PART II: SUPERMAN'S GIRL FRIEND LOIS LANE 52, PART III: ACTION COMICS 317 & PART IV: SUPERMAN'S PAL JIMMY OLSEN 80! Episode #373 Part IV: Superman Family Comic Book Cover Dated September 1964: World's Finest Comics #144! World's Finest Comics 144, September 1964! Download Episode 373 Part IV! WORLD'S FINEST COMICS 144, September 1964, was published on September 23, 1964. It contained 32 pages for the cover price of 12¢. Mort Weisinger was the editor, and the cover was pencilled by Curt Swan, inked by George Klein and lettered by Ira Schnapp. They were also the art team on the Superman/Batman story in this issue. 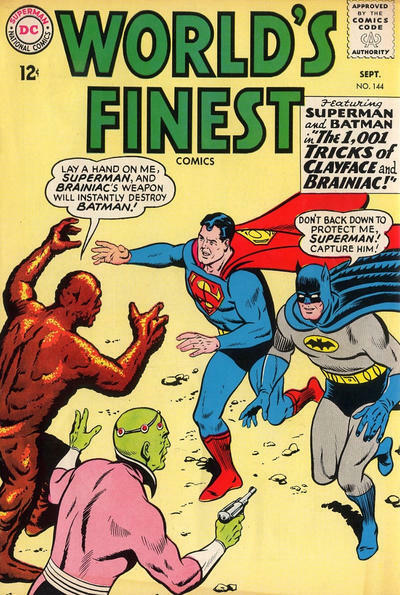 - (17:00) THE 1,001 TRICKS OF CLAYFACE AND BRAINIAC (17 pgs, [Part I was 9 pgs. long]), written by Edmond Hamilton. In this episode, we also highlight the ads and other features, including the CAPES AND COWLS COMMENTS letter column (48:44). This was the first issue of WORLD'S FINEST COMICS in which the letter column carried this title. It began by announcing the winner of the contest to name the title's letter column, who won a five year subscription to WORLD'S FINEST COMICS. We finish our look at the Superman comic books cover dated September 1964 with: PART IV: ACTION COMICS 316!